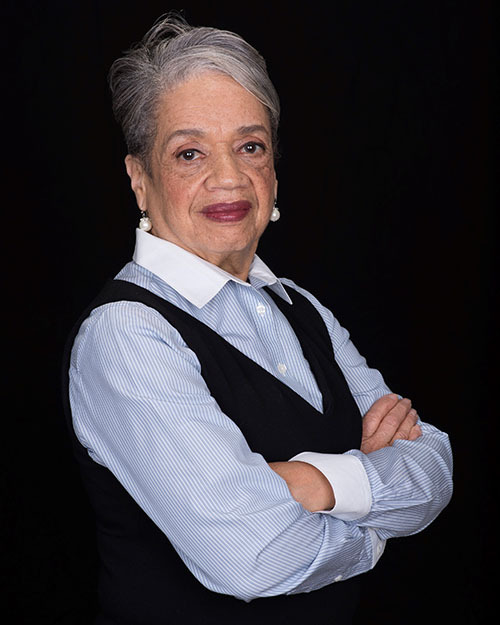 Dr. Christine Mann Darden, an American mathematician and aeronautical engineer who spent 40 years at NASA, will be the guest speaker April 25 at Palm Beach State College’s Dr. Floyd F. Koch Honors College Speaker Series event. The free event, to be held from 11 a.m. to 12:30 p.m. in the Eissey Campus Theatre on the Palm Beach Gardens campus, is open to the public, as well as PBSC students, faculty and staff. Those who wish to attend are asked to RSVP at www.palmbeachstate.edu/Honors/SpeakerSeries. At the event, themed “Patterns in Our World,” Darden will share her experiences at NASA as a “hidden figure,” and then hold a Q & A session with PBSC students. A North Carolina native, Darden retired from the NASA Langley Research Center in March 2007 as a member of The Senior Executive Service. Her final assignment at Langley was as director of the Office of Strategic Communications and Education. She also previously served as director of the Aero Performing Center Program Management Office, as a senior program manager in NASA’s High-Speed Research Program Office, and for nearly 30 years as an internationally-known researcher in high-speed aerodynamics and sonic boom minimization research. Prior to her NASA career, she taught high school mathematics. Darden is an Associate Fellow of the American Institute of Aeronautics and Astronautics, and a past secretary of its Aeroacoustics Technical Committee. She has also held memberships in several honor or technical societies. During her NASA career, Darden authored over 57 technical papers and articles, primarily in the areas of sonic boom prediction, sonic boom minimization and supersonic wing design. She is recognized as an international expert in these areas. Darden has been recognized with dozens of awards and honors—including two NASA Medals, the Black Engineer of the Year Outstanding Achievement in Government Award and the Women in Science & Engineering Lifetime Achievement Award. She has also received honorary doctorates from Old Dominion University, Muskingum University (John Glenn’s alma mater), and North Carolina State University. She has a Bachelor of Science in mathematics from Hampton University in Hampton, Va., a Master of Science in applied mathematics from Virginia State University in Petersburg, and a Doctor of Science in mechanical engineering from George Washington University in Washington, D.C. Darden also holds a Certificate of Advanced Study in Management from Simmons University Graduate School of Management in Boston. Darden’s lecture is sponsored by the Honors College, which requires a 3.5 GPA or higher to enroll and a commitment to community service. The Honors College Speaker Series aims to bring noteworthy speakers to PBSC campuses for the benefit of all students, faculty and staff, and the community at large. Past speakers in the series have included former U.S. ambassador and PBSC alumnus Robert M. “Skipp” Orr, Ph.D. and Winston Elliott Scott, a retired United States Navy Captain and former NASA astronaut.